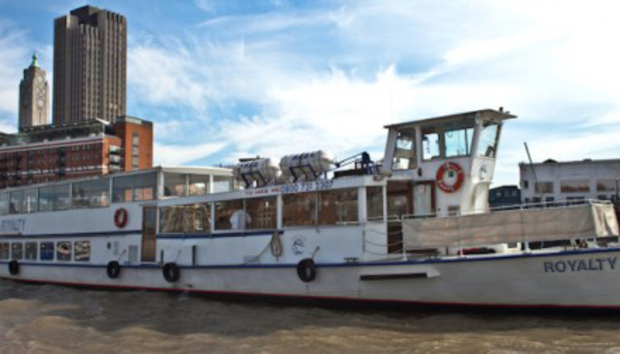 As one of the more left-field events of London Tech Week, the Boatcoin Expo offered an interesting premise: spend the day cruising along the Thames with a group of Bitcoin experts. If you believe all you read, especially about the likes of Silk Road, it’s easy to paint a negative image of the BTC community. But surprise, surprise, they’re not all fanatical anti-government anarchists with a chip on their shoulders about Chip and Pin. Bitcoiners come in all shapes and sizes [though mostly male judging from our cruise], and varying degrees of extremes. Some have been mining for years, others had barely heard of it before the major boom – one guy told me he heard about it from his mother last year. There are the anti-bankers and down with capitalism types, the firebrands, the Blockchain believers and even sceptics who like the technology but acknowledge it’s too flawed to save the world. The famous Bitcoin logo adorns t-shirts, phones and laptops all over the boat, and the same words keep popping up: Decentralised, trust, middlemen, Peer-to-Peer, and so on. Occasionally ‘fiat’ and ‘New World Order’ also spring up, but this isn’t some radical crowd. Despite the lack of Wi-fi, PowerPoint slides and even a microphone for a while, we were given a variety of views and perspectives on Bitcoin and the technology behind it. Alex Kotenko, founder and director of XBTerminal, is more of a traditional startup guy; he wants to integrate Bitcoin into everyday life with a BTC cash machine that does live conversion into ‘fiat’ money in any given store. While Niki Wiles, Community Relations at Counterparty, a global peer-to-peer marketplace that cuts out the middle men, is looking to create a financial platform where people can trade Bitcoins for Gold and commodities. Stephan Tual, CCO of Ethereum, however, isn’t really here about Bitcoins at all. “It’s not about your mother at Asda paying with Bitcoin, it’s about staying in control of your funds at all times.” He’s here about the Blockchain technology and where it can go in the future. Ethereum plans to create a decentralised programming platform that lets people build apps without a central hub. Though the currency’s anonymity is often lauded, Courtois warns that this means it’s impossible to tell where the code comes from and the potential dangers of vested interests such as criminals or the NSA. He even claims that the idea of a Bitcoin isn’t that revolutionary, and points to the idea of the “IBM Dollar” created by Edward De Bono. Olly Wasser, who runs AltCoinSpeculation, is more of a watcher. “I’m interested in the medium term, we really don’t know what’s happening in the long term.” His site reports on the varieties of Altcoins that keep springing up and dying at an increasingly rapid rate. “There’s a lot of crap in the scene, a lot to sift through,” he says, warning of the dangers of speculating on coins that are often part of ‘Pump and dump.’ Looking at the appeal Altcoins such as Litecoin, Dogecoin [pronounced by various speakers as “Doje,” “Doggy,” and “Dowg” throughout the day] and others, he explains is simply a case of missing the previous boat. “People who go into Litcoin missed Bitcoin, people who got into Dogecoin missed Litcoin. People need a stake in a coin and Altcoins give you that stake.” In a world where a coin still viable after a month or two, the future of altcoins is hazy; there could be millions in a few years, there could be successful national coins, nobody knows. Olly says he’s been approached by banks and hedgefunds who are interested, which would change the whole scene again. Michael Parsons, Bitcoin Advisor & Entrepreneur also give a brief talk on the plans for a physical Bitcoin. He plans to create a gold commemorative Bitcoin redeemable in the Channel island of Alderney that would have three values: a face value of £100, a gold value of £500 and the value of a Bitcoin of whichever day you cashed it in. He tells us that despite the Royal Mint pulling out, the plans are still going ahead – and that the Isle of Man is leaning on the island’s banks to be more accepting of crypto currencies. “The UK can lead the world in financial innovation and reverse the trends it helped create. Simon Dixon, CEO and founder of Bank To The Future is also on a crusade to add legitimacy to crypto currencies. After railing against the system that banks have in place, he says “Our time has come.” He’s been paid entirely in Bitcions for the last six months, claiming he believes in the long term vision and doesn’t give a damn about the short term price. London may be seen as a leader of financial tech, but Dixon thinks it can go further than that. “The UK can lead the world in financial innovation and reverse the trends it helped create.” Through Bank To The Future, Dixon has lobbied for equity crowdfunding to be legalised so anyone can invest in a company with as little as ten pounds, he’s pushing peer-to-peer lending, given tax relief to people paid in the crypto currency and used Bitcoins to buy stocks, so people can have an entire portfolio in BTC shares. And after spending the afternoon surrounded by them, it seems the majority don’t have a problem with money, they just have a problem with bankers and middlemen. So after a sunny cruise and many hours up close with the Bitcoin crowd, am I going to down my ‘fiat’ pounds and take up mining with Abaddon? Probably not, but if this sought after legitimacy arrives, I may have to.